He was the glue, the joker, the multi-instrumentalist and the rock ‘n’ roll of the Bee Gees and this month, it’s 15 years since Maurice Gibb’s sudden death. Thinking back to the news headlines after Maurice died (due to complications from a twisted intestine), so many stories referred to him as “the quiet Bee Gee” which never sat right with me. The quiet Bee Gee who had the superstar wedding to Lulu who was also great mates with Ringo Starr? The quiet Bee Gee who in his later years was one of the best paintballers in the world (not just at friend’s stag-dos)? Maybe he was called “the quiet Bee Gee” because he only occasionally sang lead vocals, but as a harmonist, an arranger and as a proponent of everything from the guitar to the bass to the keyboards to the drums to the mellotron, he was essential to the success of the Bee Gees. One writer who I thought got it right described Maurice as “the rock ‘n’ roll of the Bee Gees,” and for music fans (particularly in the States) who got a bizarre dose of collective amnesia after Saturday Night Fever and somehow forgot the preceding 10 years of hit songs and albums, it is the perfect description. In those early days of first-fame in late-60s London, Barry was the pretty, strong frontman with Robin as the vulnerable counterpoint. The two didn’t even really look related, but enter Maurice – all psychedelic charisma and cool, with fat, round-tone bass-lines dripping from his fingers – and you had the whole package. If rock ‘n’ roll must encompass attitude and image as well as sound, Maurice had it. 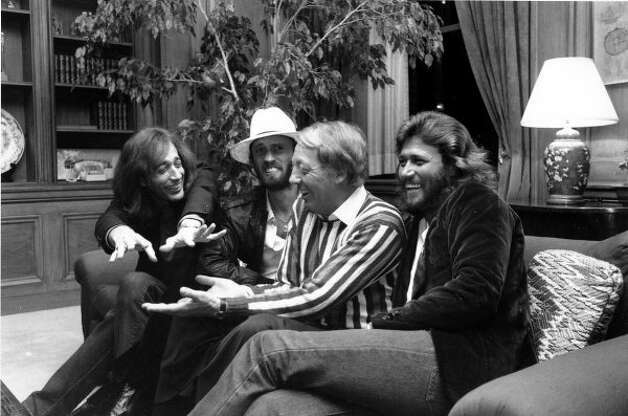 Bee Gees with Robert Stigwood. Visually it was captivating: Maurice was identifiably Barry’s brother and of course, he was Robin’s fraternal twin. With frail Robin* standing in the middle of the stage, holding his hand to his ear – a contradiction of awkward and majestic with one of pop’s greatest, most soulful vibratos – handsome Barry on the right with a pimped-out guitar and Maurice, cool like any bassist should be, on the left; it was an image (and set-list) that could never just wash over you. Maurice’s easygoing demeanor possibly hid insecurities (as his battles with alcohol may attest to), but that personality allowed Barry and Robin to flourish, to co-exist and to be the tension and spark most great songwriting teams need. And when Barry and Robin weren’t working with each other, just check those writing credits and whether it’s a Barry solo album or one from Robin, Maurice was always there. Diehard fans will also be familiar with the Gibb brothers demo album for Kenny Rogers from 1983 entitled Eyes That See In The Dark. The project is best known for the mammoth Kenny & Dolly Parton duet Islands In The Stream, but if you go back and listen to the full album and indeed, the full demo album, you’ll hear the Bee Gees at their country crossover best. Listening closely to the excellent demo versions, Robin is present as a writer, but is not as apparent as a vocalist, leaving Barry and Maurice to sing in two-part harmony. It’s in this setting as well as in concert and on another country-tinged project – Barry and Maurice’s Cucumber Castle from 1969 – you can hear loud and clear the mastery of harmony that Maurice possessed. Seven years ago, on the eighth anniversary of Maurice’s death, I wrote a tribute which featured the song Railroad – you can link to the piece here. Railroad is a country song in the same way Massachusetts is: the influence is there, but so too are strands of folk and in Railroad‘s case, the kind of kind of roots-rock The Band did so well. Railroad is not only my favourite Maurice Gibb song, but is one of my most loved of any Bee Gees songs. Two years on (the title of fine Bee Gees album I might add – 1970), I’ve chosen another song from the same era, Maurice’s self-proclaimed “swamp-rock” period. This song has recently had a second-life having been sampled by The Verve’s Richard Ashcroft. So for you, if like me you miss Maurice Gibb and are thankful for all he did, here is On Time plus Richard Ashcroft’s very Oasis-like (and very good) reworking entitled Are You Ready. *The early visual image of the Bee Gees onstage during the late 60s was unforgettable. Alongside their compelling songs, the three brothers had such a unique visual presence. The symmetry of the visual of Maurice, Robin and Barry was fantastically unusual. Regarding Robin, in 1960s London, he was a pop star like no other: vulnerable, shy, awkward and though still a teenager, an old soul with a massive imagination and a knack for mysterious, sad, hilarious and emotional lyrics. Note: This article was previously published in 2013 under the title ‘Richard Ashcroft Sampling The Bee Gees – 10 Years Since Maurice Gibb’s Death’. Love the cover. Without info, l would have thought this was Spencer, Robin’s eldest son.